Take a plunge off the high dive at the outdoor pool or have a picnic at the Student Activity and Academic Center (SAAC) on the Clairmont Campus. 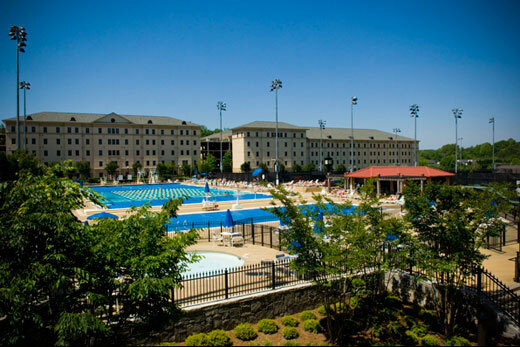 • Take a plunge off the high dive at the outdoor pool or have a picnic at the Student Activity and Academic Center (SAAC) on the Clairmont Campus. • Start a fitness routine with a personal trainer at the Woodruff Physical Education Center, the SAAC or the Blomeyer Health Fitness Center. "Summer is definitely a great time to start, especially if you are training in a nice air-conditioned facility like the Woodruff P.E. Center," says fitness coordinator Kari Hunt. • Take a yoga class, tennis lessons or try a Zumba dance fitness class — all are offered through many Emory programs and facilities. • Quit smoking with a Freedom from Smoking session offered by the Faculty Staff Assistance Program. • Take advantage of free wellness coaching services for fitness and nutrition at the Faculty Staff Assistance Program, or schedule an appointment with one of the FSAP clinicians to address stress management, grief issues, relationship challenges, career goals and workplace concerns. "Summer is a good time to pause and engage in positive self care," says Melissa Morgan, manager of FSAP wellness programs. • Enjoy the foods that say summer at the Emory Farmers Market's three special events: an Ice Cream Social on June 26; a grilled foods and watermelon seed-spitting contest July 17; and a Tomato Centric Celebration on Aug. 28. Emory Summer Concert Band. Photo by Tom Brodnax. 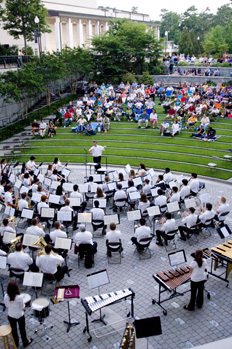 • Bring a picnic and enjoy music by the Emory Summer Concert Band on Patterson Green in the courtyard of the Goizueta Business School. Concerts are Thursdays, July 12 and July 19 at 8 p.m.
"Musical fare is light, and includes classical transcriptions, original wind band literature, marches, folk music, dances, and selections from film and musical theater," says Scott Stewart, director of wind studies. "Admission is free, and families and picnics are encouraged." • Learn more about the treasures within the Carlos Museum's permanent collection. Although the Ancient American galleries are closed until January for extensive renovation, the Asian, Classical Greek and Roman, Egyptian and African galleries feature highlights from the ancient civilizations. Priyanka Sinha, director of communications and marketing, suggests allowing around two hours for a visit, enough to appreciate the collection without feeling overwhelmed. "The museum is a great place to take a break, reflect and see highlights from each collection," Sinha says. "It's also turned out to be a great date place." • Draw the Classics at the Carlos Museum. Beginning June 15 through mid-August, "meet in the rotunda of the museum at 10 a.m. with drawing pad, pencils and a soft eraser," says Julie Taylor Green, senior manager for school programs and docent guild at the Carlos. Docents will lead a "draw with the masters" session in the Asian, Classical Greek and Roman, Egyptian or African galleries. "Participants range from experienced artists to those who have not spent time drawing since elementary school," she says. • Explore Chinese culture at the Woodruff Library's new Chinese Culture Exploratorium, an interactive, multimedia exhibit. • Check out popular fiction "beach" books or movies from the Robert W. Woodruff Library, and borrow a Nook or iPad. "A lot of Emory staff may not realize they can do all those things here," says Holly Crenshaw, director of communications at the library. • Join the monthly Noble Reads book club at the Emory University Bookstore. • Learn about technology or find guidance on a project at Emory's Center for Interactive Teaching (ECIT), open to faculty, staff and students. Faculty can check out new technologies, such as a WordPress installation specifically for teaching, a new student response/clicker system. Faculty can also take advantage of ECIT's summer programs, says Wayne Morse, ECIT director. • Take a class from Learning Services, the division of Human Resources that offers professional development opportunities. • Check out a book from the library at Learning Services to brush up on management and professional improvement topics. • Review progress on your professional development goals; talk to your supervisor about the possibility of participating in a Learning Services program in AY2012-13, such as Excellence Through Leadership, and programs for managers, supervisors and administrative staff. 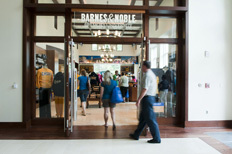 • Join Children's Story Time every Wednesday at 10 a.m. at the Emory University Bookstore. Summer visitors will include the "Wild Thing" and "Tacky the Penguin." "Always a fun story, often a great activity and sometimes we even have story characters. This event is fun for all ages," says Myra Haley, bookstore director. • Hire a student to help with yardwork, babysitting or tutoring. The Emory Employee-Student Job Network remains active in the summer, says Aaronnette Jackson, human resources associate at Emory WorkLife Resource Center. • Parents and their middle and high school students can learn about mapping the trail to college, including how to apply and pay for college, through upcoming programs offered by the Emory WorkLife Resource Center. • Look for the latest updates on camps and learning programs, area events and activities, and discounts and bargains in WorkLife's Summer Planning guide. Keep checking Emory's Events Calendar for more opportunities and events throughout the summer.